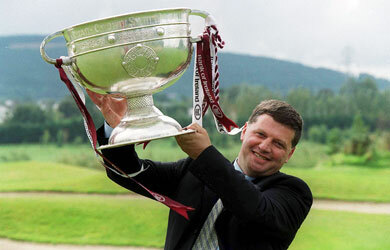 ON TOP OF THE WORLD John O’Mahony pictured with the Sam Maguire Cup after he led Galway to the 2001 All-Ireland Football title. He now seems almost certain to be the next Mayo manager. IN wthe wake of John Morrison’s resignation the departure of Mickey Moran was inevitable. Having met officials of the County Board in Sligo, Mickey and Mayo parted company after a season that, despite their inglorious exit from the All-Ireland final, could scarcely be described as devoid of success. To have reached the semi-final of the National League and the final of the championship must count for something whatever misgivings there were between board and management. No animosity can be read into the valedictory statement issued by the County Board following the Sligo meeting. While a warm embrace between the two was an unlikely parting sentiment, the statement conveyed Mickey Moran’s thanks to those with whom he worked throughout the season, gracious comments from a man that might have reason to feel hard done by. Perhaps the greatest regret of his leaving is the fact that we do not really know how good a manager Mickey Moran is. The real test of his ability would have come in his second year. We would have discovered whether he himself had learned anything from the experiences of the previous year. Would the knowledge he acquired in leading Mayo to the All-Ireland final stand to him, help make Mayo a better side, and himself a coach of superior quality? Who knows, maybe the final decision rested with Moran himself. Maybe he came to the conclusion that he had nothing more to offer Mayo, and that it was not his wish to remain for another season. So now the hunt is on for a new supremo. And already there are calls on the County Board to sound out John O’Mahony once more on the basis that this might be the opportune time for the former Galway manager to accede to their request. O’Mahony turned down the Board’s invitation last year, and the only development in the meantime is his candidacy for the General Election next year. Recent opinion polls indicate that support for O’Mahony’s election to the Dail has not taken off, and there is widespread belief that if he took charge of the Mayo team his popularity would grow overnight. The result of the surveys has already brought some urgency to his political campaign, but whether taking over the Mayo job would enhance his prospects is doubtful. While announcing his retirement from Galway management, O’Mahony told the players with whom he had built a close seven-year relationship that he would not want to manage a team to oppose them. His refusal to take the helm in Mayo may have had something to do with that statement, together perhaps with the feeling that he could not fulfill the All-Ireland winning expectations of Mayo people. Nothing has changed much in the meantime, and speculation is growing that now is the right time for the board to make another approach. It places the Ballaghaderreen man on the horns of a dilemma. To refuse might invite a backlash from the GAA fraternity at the polls. If on the other hand he agrees to take the reins his decision could be interpreted as being opportunistic, doing it for the wrong reasons . . . for what he might gain at the polls rather than out of fondness for his own county. And if the Ballaghaderreen man is elected to the Dail how much of his time can he then dedicate to Mayo football? The best outcome for O’Mahony would be for the Mayo GAA Board to recognize the dilemma in which an approach might place him . . . and to ignore calls for his return to the helm. But it does appear that a deal has been done with the Ballaghaderreen man, that it had been done long before Mickey Moran led Mayo into the All-Ireland final, and that Mickey Moran came within a whisker of upsetting the applecart by guiding Mayo to an unexpected final. BALLAGHADERREEN come to MacHale Park on Sunday in search of their first Mayo senior football title since 1972. They bring with them irrevocable memories of one of the great teams to have won the championship, climaxing the most successful era in the history of the club, which began with a county minor title in 1968. The winning of that title was followed by a county junior title the same year, the Mayo intermediate title of 1971, and the senior and under 21 championships the following year. In fact the intermediate title of 1971 was not played until the spring of the following year, a year of unprecedented success for the East Mayo club . . . intermediate, senior and under 21 all accomplished in that one season. Many members of the victorious senior side came through the ranks. The all-conquering minor side boasted the presence of players who would soon become household names at inter-county football level. Malachy Dooney, John O’Mahony, Frank Burns, Con Moynihan and Sean Kilbride played for the county at various levels. Kilbride, Burns and Fleming were members of the successful junior team of the same year which also included the late John Morley who was to flower into one of the country’s finest footballers. Morley captained the intermediate team that won the ‘71 championship . . . in the spring of 1972. And later that year that same team claimed the premier competition. It was a formidable side, more impressive than many who have won the same title. Among the array of stars was Mick Reynolds, the holder of three All-Ireland senior medals won with Galway. In addition to those already mentioned, names such as Martin Hannon, John McKenzie, Frank Kelly, Christy McCann and Pat Dooney were a match for the best in the county. What manager would not be thrilled to have players of that calibre to call upon today? The wonder is, of course, that they never won another senior title, never reproduced the form of that one season. Only the players themselves can explain why. Of that side, John Morley, Jim Fleming, Sean Kilbride, John McKenzie Frank Burns, Dan O’Mahony, John O’Mahony, Christy McCann, Con Moynihan, Gerry Coleman and Malachy Dooney played senior football for the county. The last occasion they appeared in a county senior final was 1985 when they lost to Ballina Stephenites by a single point. John O’Mahony was at full-back, and Frank Kelly at midfield, the only members of the team of 1972. Dermot Flanagan and Noel Durkin, who represented Mayo for some years, were also members of that side. So they come back to MacHale Park, a new, young side, hoping for a new breakthrough, taking on one of the great clubs of all time, who have distinguished themselves at county provincial and national level, won all there is to be won in club football. On Sunday Crossmolina are seeking their seventh senior title, their sixth in eleven years. Their victory over Ballina Stephenites – who have also attained the highest honours in the game – in the semi-final was ingrained with conviction. But it took a dramatic last-minute goal by man-of-the-match Peadar Gadiner to clinch it. They have now been installed as favourites to win their seventh title against the inexperienced men from the border town. The personnel have changed little over the years. Ciaran McDonald, the Nallens, Gardiner, Joe Keane and Paul McGuinness, still make up the engine room, still set the example. They are the form moulders and if they fail to reach the required standard, the team will lose its even beat and perhaps grind to a halt. That is a rare occurrence, and Ballaghaderreen will be hoping to throw a spanner in the works on Sunday. They had a notable victory over Knockmore in the semi-final, and in delegating Stephen Drake to nullify the skills of Aidan Kilcoyne demonstrated their ability to plot a successful course. With John O’Mahony a member of the backroom team you can expect a new strategy to deal with the danger Ciaran McDonald poses. Maybe they’ll install Drake at centre halfback to cope with the Mayo star. They themselves are not scarce in talent. Barry Kelly and James Kilcullen are midfielders above the ordinary. Derry Moran, Barry Regan and Andy Moran are not wanting in attacking experience while in defence David Kilcullen, Declan McGarry, Thomas Regan, Joe McCann and Gary Conway form a defence that makes up in tenacity what it might lack in flair. Because we do not know the full potential of this latest team to arrive on the scene, we must give the defending champions the vote to survive, but they may find it more difficult than many expect, and we will not be too surprised if Ballaghaderreen succeed in bridging that gap that spans 34 years.